Photographer Todd Latimer sued motorcycle manufacturer Kawasaki www.kawasaki.com and Hachette, the publisher of Cycle World magazine www.cycleworld.com because Kawasaki used 5 of Latimer’s photos of a newly developed, highly customized ZX-14 bike in a 110 photo press release and because Hachette (herein “Cycle World”) used 3 Latimer photos, one in the table of contents and the remaining 2 in an article about the newly released ZX-14 cycle. 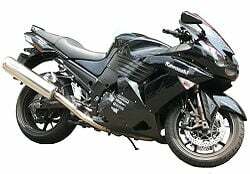 Years ago, the Florida U.S. District Court (the trial court) entered summary judgment for Kawasaki and Cycle World finding that their use of Latimer’s photos in the press kit and in the magazine were fair use. The Eleventh Circuit Court of Appeals then found that (a) the photographer had granted an implied license to Kawasaki but (b) overtured the District Court’s decision that Cycle World’s use in the magazine was fair use. The present decision is a re-match in the District Court, Latimer v, Roaring Toyz Inc., Case No. 8:06-cv-1921-T-30AEP, U.S. District Court, Middle District of Fl., Sept. 21, 2010 (available here). In this remanded case, the District Court denied Kawasaki and Cycle World’s motion for summary judgment on the issue of fair use (because factual issues remain) but granted summary judgment on the issue of damages because Latimer’s claim for Kawasaki’s profits and Cycle World’s profits was speculative. “[A] plaintiff may not seek gross revenues based entirely on a speculative connection to the plaintiff’s claim.” Latimer v, Roaring Toyz Inc., Slip opn. 10, quoting Thornton v. J Jargon Co., 580 F. Supp. 2d 1261, 1280 (M.D. Fla. 2008). Fair use is a difficult defense to prove up since the Copyright Act grants to the owner several exclusive rights, including the right to reproduce the copyrighted work and to distribute copies to the public. 17 U.S.C. 106. [U]nder the fair use doctrine, codified at 17 U.S.C. § 107, some limited and useful forms of copying and distribution are tolerated as exceptions to copyright protection. Specifically, § 107 provides fair use may be made of material “for purposes such as criticism, comment, news reporting teaching (including multiple copies for classroom use), scholarship, or research, is not an infringement of copyright.” The four factors considered to determine whether a use is a fair use are: (1) the purpose and character of the use, including whether such use is of a commercial nature or is for nonprofit educational purposes; (2) the nature of the copyrighted work; (3) the amount and substantiality of the portion used in relation to the copyrighted work as a whole; and (4) the effect of the use upon the potential market for or value of the copyrighted work. Latimer v. Roaring Toyz, Slip opn. 6, citing the Copyright Act, 17 U.S.C. § 107. This case shows that the use of a photo in any commercial publication is fraught with issues. The better practice is to secure copyright clearances from all photographers and any models shown in the photos. See Florida Law on Unauthorized Use of Image, Unauthorized Use of Name, Fla.Stat. 540.08. Also, the photographer’s limited victory in the second summary judgment regarding fair use is somewhat pyrrhic since he cannot collect profits from Kawasaki ’s use of the 5 photos in the ZX-14 press kit nor Cycle World’s profits in the sale of its magazines. A jury will decide whether Kawasaki’s and Cycle World’s use of the photos was fair use. Notwithstanding the jury’s decision, the photographer is left with injunctive relief, possibly statutory damages and attorneys fees if he registered the copyright to the photos prior to publication by Kawasaki or shortly thereafter.